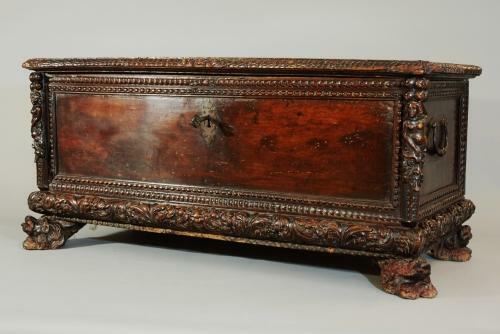 A superb walnut Italian cassoni dating from the mid 17thc of excellent patina (colour). The top has a superb original colour & has a carved moulding around the edge with a carved grotesque mask in the centre. The front panel has both a carved ball & also carved leaf decoration which frames the plain panel. The piece has an original escutcheon & lock with the original pierced steel key. At each of the front corners is a carved figure, a carved caryatid holding fruit above her head & with a grotesque mask underneath. Each of the side panels have the same carved ball & leaf design & original handmade carrying handles. The bottom deep rail at the front & sides has a deep foliage carving of scrolling acanthus & in the front rail a central carved grotesque mask. The four decorative carved feet are in the form of the head of mythical creatures. There is slight decay to the feet, due to both the age of the piece & the fact it probably stood on a cold, stone floor for years, but I feel this adds to the character of the piece. It is also amazing that all four original feet still exist. This would be an ideal coffee table or used for storage, maybe in an entrance hall. It would look stunning as a statement piece against a plain wall in any interior, either old or new. The Renaissance was the great period of the cassoni, although they continued to be made up until 19thc. They have survived, often due to the fact they were made in pairs as marriage chests. They were also of such good quality & design that the generations they were passed down to treasured them as works of art.